Confession should be properly prepared for. A proper preparation is necessary to approach Jesus in the sacred tribunal and to make a good Confession. 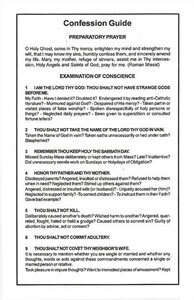 Includes: Preparatory Prayer, Examination of Conscience, Act of Contrition.